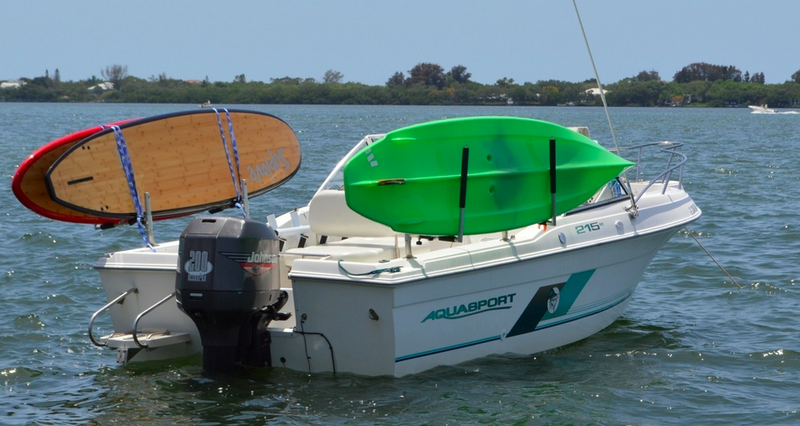 If you're looking to take your paddleboards along with you while you cruise around in your fishing boat or pontoon boat, you definitely need to check out our paddleboard boat racks. These racks will ensure that your SUPs are secure until you reach your out at sea, lake, bay or river destination for your paddleboard adventures. SUP Rack for Pontoon Boats: this SUP Rack is a J-style rack that hangs off the side railing of your pontoon. Installation is super easy and you can space the rack arms apart however you need so that you can fit your specific SUP's length. Included with the rack are two tie down straps which slip easily through the rack's eye loop allowing you to secure your SUP quickly. This rack will hold one or two SUPs including inflatable, surf, and touring SUPs. Each rack arm is completely padded which provides plenty of protection in calm or choppy waters. SUP Rack for Fishing Boats: These racks are designed to specifically work with fishing boats by sliding directly into the fishing rod holders. The SUP Rack for Fishing Boats can either hold 1 or 2 SUPs in the rack. The rack is completely adjustable so you can make it fit any size paddleboard. This rack has tons of great features like the ability to swivel. 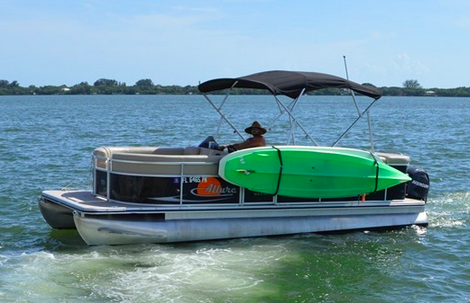 When your rack is not in use, you can either remove it from the rod holder or simply swivel it inside the boat. The SUP rack also includes an extension for your rod holder, which means you can continue to use the rod holders as well as store your SUPs.